IIFIYM – what does this mean? IIFIYM means If It Fits In Your Macros, meaning you use an online calculator or an IIFIYM coach to give you a breakdown or what number of calories you should eat per day depending on your goals and what % of those should be fat, carb and protein sources per meal and for the day. The good thing about about this way of eating is that you can literally eat anything. This is not exactly clean eating, although some people who follow this way of eating have two clean meals which are low calorie and then one splurge meal per day. Others have a splurge meal like the ones in the photos below on days where they are heavy lifting or training for a longer amount of time. My main fear about this kind of diet plan is that it’s not a one size fits all- some people are very intolerant to processed foods and although they may see weight loss and fat loss initially, my fear is that they may be doing irreversible damage internally by following a high sugar diet. Certain ailments show no symptoms until damage is already done so this is important to keep in mind. 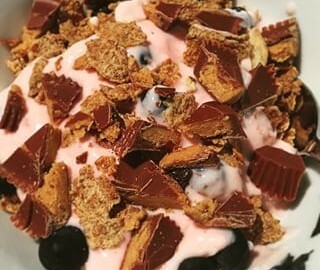 I’m seeing an increasing number of young girls in particular across Instagram choosing this way of eating with quotes such as ‘chocolate for breakfast’ and so on but unfortunately while this might be OK every now and again it’s really not the healthiest route to be following particularly if your end goal is a long, healthy life. Sugar= inflammation = sickness which is definitely something to keep in mind. Although I’m a firm believer in balance and having the odd treat, particularly if it’s on your mind and making you feel bad about yourself, if you’ve been training loads and eating very clean, but for some people, the more sugar they consume, the more sugar they crave- I’m a little like this myself. I love a little weekly trip to Mooch for a frozen yoghurt with a ‘healthy’ blob of Nutella and toffee sauce as much as the next person but feel my tolerance levels and my mood changes hugely when I over indulge, and indeed watching friends and family around me I can see the same. How do you feel about this way of eating? I’m interested to know what you guys think! Are you more of a ‘cheat meal’ kind of person or do you follow IIFIYM?